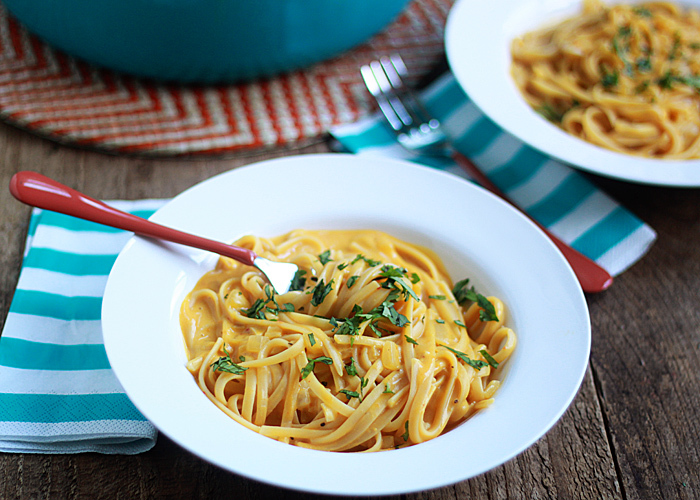 Luxuriously creamy pumpkin pasta in 20 minutes! It’s possible with this super-simple vegetarian one-pot pasta recipe. My favorite easy fall dinner. 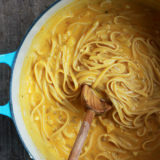 I first posted this one-pot creamy pumpkin pasta recipe just about two years ago, on September 9, 2014. On its (almost) two-year-anniversary, I thought I’d share it again! It’s been a huge favorite of readers (and of ours!) ever since I shared it. I had to curtail dairy shortly after creating this recipe, so about a year ago, I updated it with a dairy-free alternative. I’ve also got a brand spankin’ new recipe video that shows just how easy the one-pot pasta method is! (Hint: ridiculously easy!) Scroll to the bottom to take a peek. And happy pumpkining! I’m obsessed with one-pot pasta – you know, the one Martha Stewart popularized just over a year ago, and the one that took the blogging (and general) world by storm? Just in case you’re not sure what I’m talking about, here’s the deal. You put a bunch of stuff in a pot. Veggies, water or broth, seasonings, and dry pasta. Then you cook it on high, tossing and stirring, until just under 10 minutes later, your pasta is done. The veggies are cooked, a sauce has formed, magic has happened, dinner is served, dishes are all but nil. One-pot pasta is a good thing indeed. Martha Stewart pun not intended. 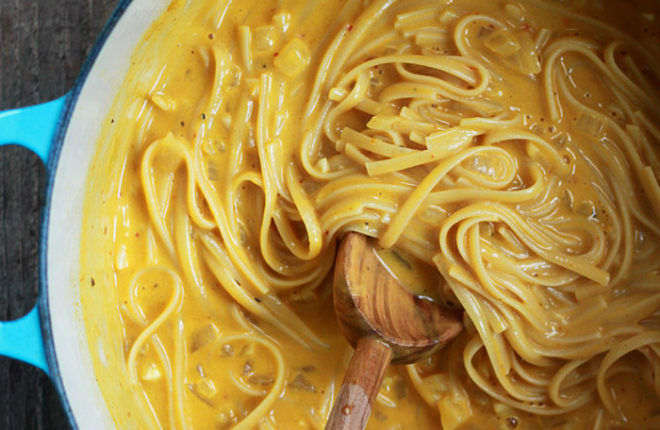 This One-Pot Creamy Pumpkin Pasta cooks up in a flash and results in an incredibly creamy pasta. It cooks up so creamy, in fact, that it actually reminds me of a less-fattening Fettucine Alfredo. And it’s just as good! Except prettier. Because it’s orange. I kept this one really simple. Linguine – it’s my one-pot pasta comfort zone. Broth, onions, garlic, pumpkin puree. A few red pepper flakes for heat. Nutmeg, creamy goat cheese (or a few alternatives – see the recipe for more), and a few flecks of parsley for color (and because parsley rules my world). This totally works as a main dish, but can also function as a substantial side if you desire. Either way, for us, it’s a big-time keeper. 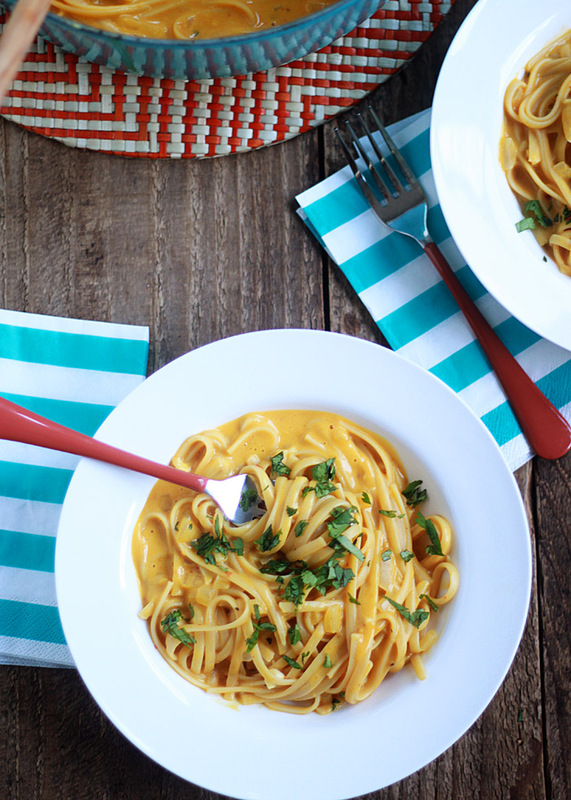 And now, there’s even a video showcasing how easy this One-Pot Pumpkin Pasta is to make! Add all ingredients except the goat cheese and parsley (and any additional salt and pepper) to a large, heavy pot – I use a 7-quart dutch oven. Place the pot over high heat and bring to a rolling boil. As soon as it comes to the rolling boil, set the timer for 9 minutes. Stir and toss with tongs as it cooks, stirring frequently for the first few minutes and then constantly as it thickens and begins to stick to the bottom of the pot. When the 9 minutes is up, the pasta should be tender and the sauce will have thickened slightly. If the pasta is not yet cooked, continue for one more minute. Remove from heat. Crumble goat cheese into the pasta. Stir gently until melted and combined. Let sit for 5 minutes (at this point, the pasta will seem somewhat soupy, but it will thicken as it sits). Stir and taste. Add additional salt and pepper if desired. Divide between bowls and sprinkle parsley over the tops. *Vegetable broth note: I suggest low-sodium broth so that you can better control the amount of salt. If you only have full-sodium broth on hand, I suggest omitting or greatly reducing the salt and then adding it at the end to taste. **Sour cream may be substituted for the goat cheese. Substitute 4 ounces of your favorite vegan cream cheese. I’m partial to garlic and herb vegan cream cheese – fabulous in this! Coconut cream also works. Also delicious without any cream or cheese. Follow dairy-free option and also make sure your pasta is egg-free. Omit or greatly reduce the crushed red pepper flakes. You can sprinkle a few flakes over the top of the grown-ups’ portions when serving, if you’d really like a bit of heat. This was seriously amazing. Just sent it to my family and friends! I made it with gluten free brown rice pasta and did not need to adjust the liquid at all as the pasta cook time was 11 minutes–just the right amount of liquid was left plus perfect for leftovers since rice pasta soaks up so much as it cools! I will be making this all the time for all the flavors and it was so easy! I wasn’t thinking and I bought fresh pasta instead of dry linguini. How do you think this changes things? I definitely shouldn’t put it in at the start but didn’t know if you had any recommendations. Hi Maddy, I don’t think fresh pasta would work, sadly. This method would probably turn fresh pasta to mush! Perhaps try adding it in the last couple of minutes like you said, but then I’m not sure you’ll get the same creamy consistency. So sorry to hear it didn’t turn out. Can I help you troubleshoot what might have gone wrong? This recipe was a bust – everyone in my family agreed that it was a gross, gelatinous, pile of yuck. Prepared exactly according to directions and it came out very, very gooey. Were I to try it again, I would double the pasta amount, cook it in a separate pot (you’re already using the stove and its not like a pasta pot adds any significant clean-up time), and dilute the sauce. I appreciate the focus on creating quick, one-dish meal, and the ingredients seem like they could be great, but I think I’d rather take the time to sautee the onions and garlic slowly in wine and simmer the ingredients slowly — just throwing them together in one pot created a generic flavor and the individual flavors were obscured. I lost my sense of smell years ago in an accident, and ever since nuanced flavors are lost on me….they simply don’t register on my palate. I want to cook this for my guy but he won’t like the red pepper flakes (will LOVE the goat cheese though! )…do you think replacing with a little paprika would work – and if so, how much would you suggest I use? A little paprika (especially smoked) would probably be nice, but you can omit the red pepper flakes entirely if you like. I just like the bit of head they add but it’s still plenty delicious without! I wasn’t sure if this was going to be the pasta for me since I’m not crazy about pumpkin or putting heavy dairy in my foods but I veganized the recipe like it said I could and oh my heavens this was the most delicious thing ever!! I have some leftover in my fridge but honestly I don’t think it’ll make it past dinner thought! Amazing recipe! Will for sure be making this again! what can be substituted for the wine? we don’t drink wine (I am allergic) and it is too expensive to buy for the occasional recipe. Hi Trish, you can just leave the wine out. It should still be plenty delicious! I just made this tonight. PERFECT! I had a rough day and this is just the warm, homey dish I needed. It’s so creamy! The only change I made to the recipe is the linguine-I used whole wheat instead. 🙂 Thanks for posting this! It’s a keeper for me! This was delicious!! Substituted chicken broth for vegetable broth and omitted wine and everything turned out great. My family enjoyed the dish and didn’t realize they were eating pumpkin! Will make again. Thanks. I can’t figure out how to rate this but if I could I’d give it 4.5/5 stars. I made it because I got home from work at 9:30 and had approximately all the ingredients on hand for an easy dinner. I substituted whole wheat spaghettini and used cayenne instead of red pepper flakes but otherwise followed the recipe and it turned out great! I also added peas because I love peas, and didn’t have any parsley, but parsley would be amazing! Amazing! I followed the directions exactly, and it was really exceptional. My husband took one bite and said, “Oh WOW!” I’ll be keeping this one in the regular fall/winter loop—thank you! Would this freeze okay? Or will the pasta go to mush? How many days do you think this would last fresh? Thanks! Hmm, I’ve not tried to freeze it, but my hunch is that it would not go well. I refrigerate it for 2-3 days. Hope that helps! Second: The first time I made the recipe it was waaayyy to salty. Too much broth. the second time I used two cups broth and two cups plain water, that was way better. Thanks so much for the note on the broth. I’ve updated the recipe to suggest low-sodium broth; much easier to control the salt content that way. I just made this and LOVED it. It took a couple bites to get used to the goat cheese flavor because it’s not something we usually eat, but after that I devoured it. 2/3 of my kids liked it. The other 1/3 doesn’t like anything. Thanks for a great recipe. It’s so quick and easy, I’ll probably make it for myself for lunches. A word from the not-so-wise: a can of pumpkin is TWO cups, not one. It’s not -terrible- if you use the whole can, but it’s not great either. Absolutely delicious, and so easy too. Used cream cheese as goat cheese is too hard to find here (Japan). Will definitely make again in the future! Thank you! Haven’t seen anyone mention making this with short pasta, which is a shame, because it seems like such a perfect fit for the long-ish cook time. I didn’t have any linguine but did have cellentani (they look kinda like macaroni screws) and decided to give it a try. Kept everything else pretty much the same, besides omitting the nutmeg and throwing in some chopped sage, which I think goes great with pumpkin (also omitted the parsley, but simply because I didn’t have any). Didn’t really bother measuring the onion, just eyeballed it, and used a bit more goat cheese than recommended just because. Final result? Quite good, although I can’t say I can taste much pumpkin in there. Probably gonna taste better tomorrow, after it sits for a while. I think I will definitely make it again sometime, but use more pumpkin puree to give it a stronger effect. I love the sound of this pasta dish and I have everything to go except I really dislike goats cheese, sour cream and cream cheese eek! Before I rule this recipe out altogether, do you have an alternative I can use? It’s still pretty good without goat cheese, sour cream, or cream cheese. It might be a bit runny at first but should thicken up. Perhaps a splash of heavy whipping cream or coconut milk. Made this tonight, and the whole family loved it. I subbed whole wheat linguine, upping the liquid by an additional 1/2 cup water (although I had plenty of sauce and likely didn’t need to), and it turned out beautifully. We also used vegan cream cheese since we try to avoid dairy, so I appreciated that option. Thanks for the quick and easy recipe! I have made and enjoyed this so may times at home since the original post, but this is also my go to for making dinner at a friend’s house because i can prep everything at home. I put the wine, olive oil, onion, garlic, nutmeg, red pepper flakes, salt, and pepper into a jar so i don’t have to dirty any of their dishes except for one pot and one stirring implement. It comes out so impressive and flavorful! Love this! 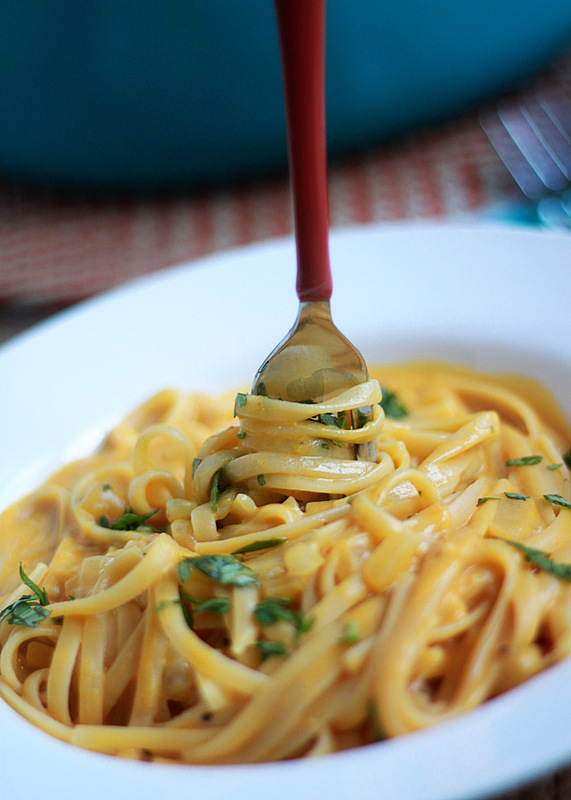 I looove pumpkin in pasta dishes and this just looks so perfect. Im a huge fan of goat cheese and I’m definitely going to give this a shot! Oh no! It was awful. Way too much vinegar 🙁 I had to throw the whole thing out after I tried to counteract the vinegar with baking soda. Eek! Oops I mean white wine. But it was my fault. I used bad white wine. Don’t skimp on the good wine. Does it really need the cheese? Im lactose intolerant and vegan cheese is expensive. ..plus i just dont really like the taste of it. If its just for garnish i get i can diss it, but if its to make it creamy whats a good substitute? I’ve tried it without any cheese, vegan or otherwise, and it’s still pretty good. Definitely not AS good though! Another option is to stir in a couple of spoonfuls of cream from a can of coconut milk. I’m not even sure how many times I’ve made this anymore. A ton??? IT’S SO GOOD. I’ve made it with coconut cream and it was tasty, but it’s infinitely better with the vegan cream cheese recipe from Avocados and Ales. Perfection. Thank you!!!! This was amazing, before the chèvre. Without the chèvre, it was light, yet hearty and delisouly fragrant; I could not wait to eat it. I went ahead and added the chèvre and bam, ruined. It became thick, gritty and sour tasting. The chèvre just didn’t fit quite well, sour cream may have worked better, but it’s really just totally unecessary, imo. I also think I’ll cook the pasta separately next time. 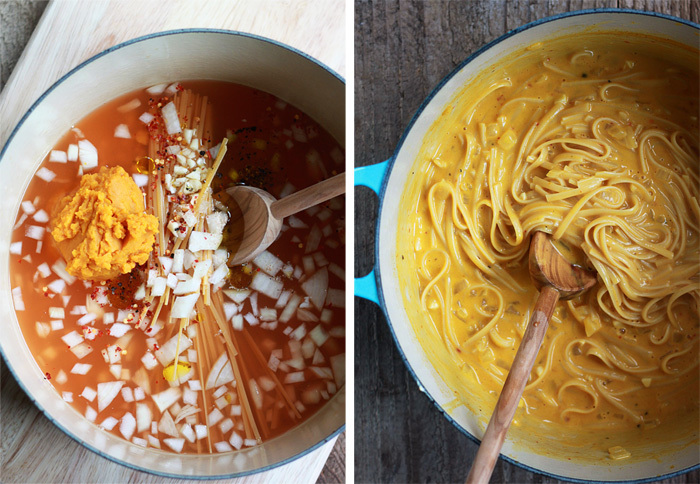 I love this recipe and through it have even convinced my husband’s parents that pumpkin pasta. We’re in the UK, so it’s not such a common or beloved ingredient! It’s tangy and creamy and warming – I really just absolutely love it. Best served fresh, but I’ve had leftovers for lunch before and it’s still really yummy. I made this with a touch less wine and a bit more pumpkin than called for (based on what I had), and I still feel like I ended up with too much liquid. Also, word to the wise, I think this is not one of those recipes where Greek yogurt and sour cream are interchangeable. The yogurt didn’t integrate into the sauce very well. This recipe was delicious!! I accidentally used 16 oz of pasta (because I didn’t read the directions whoops!) but just ended up adding another cup of water, pumpkin and more spices and it turned out perfect. Thank you for sharing such a quick amazing meal! Recipe sounds delicious and easy. Our preferred pasta is angel hair …could that be used in this recipe? If so, how would the amount of liquid and the cooking time need to be adjusted-if at all? Thank you! This is seriously a staple in my house if I want some comfort food , being nice and full and including leftovers. Mine looked a bit darker than the photo and much thicker (why I took half a star). I used a bit more pumpkin and white wine and threw in a whole box of pasta just to make the consistency a little less thick. I have also switched back and forth between veggie broth and stock and I feel stock gives it much more of a punch in flavors. I also seriously love how this is in one pot no access cleanup other than the little measuring spoons which I think I can manage with lol. But overall I feel like this is a very “can play around” with recipe! This was published in a buzzfeed article for vegetarian recipes for fall. I made it with a can of chicken broth (low sodium), an 8oz box of veggie broth and plenty of water – no wine cuz I didn’t feel like opening a bottle for this recipe since I’m not serving it (just for me for lunch!). I took it upon myself to cook it in stages because I’m Italian and it makes me uncomfortable to put pasta in liquid before it’s boiling. I sautéed the onion and garlic just a little with a drizzle of evoo and a little pink salt. I added the thyme and my liquids and then stirred in the pumpkin. Once it was starting to bubble I added macaroni – I used a mixed fusilli because for a thick sauce like this, short pasta is better. I cooked it slightly too long (a symptom of one-pot pasta since you’re timing sauce and pasta together). I think if you just cook the sauce with less liquid or for longer and cook the pasta separately, you’ll have better results. The taste was good and I’ll make it again but I don’t like mushy pasta. Too hard to control the texture in this scenario. Froze the extra 1/2 can of pumpkin for something else. Ciao it’s “Octoberghetti” the celebration of spaghetti dishes and recipes during the month of October. Who says, October is only for beer. I LOVE this dish. Every time I make it it’s a crowd-pleaser. I was thinking of subbing pasta for spaghetti squash. I would have to cook the spaghetti squash separately from the sauce. Have you tried this? What recommendations would you make to alter the recipe? Thank you so much! 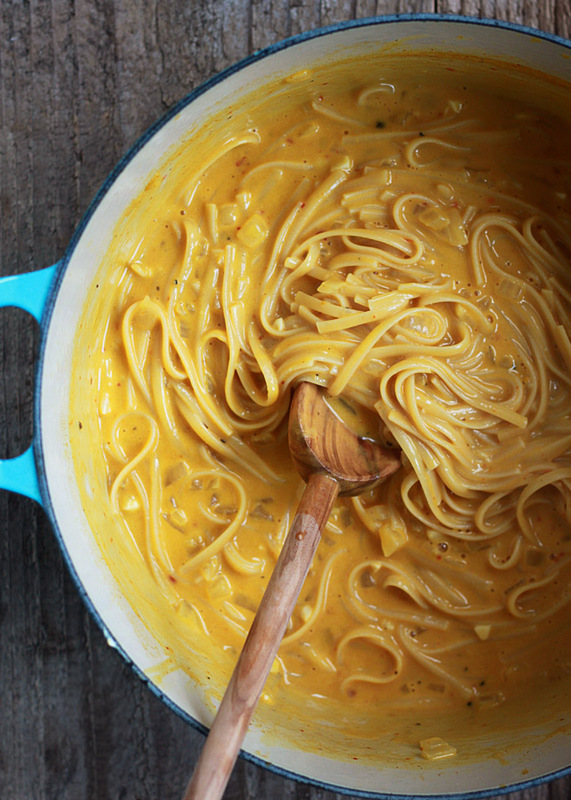 Gosh … a creamy pumpkin spaghetti squash sounds so good! I’m not sure how it would work here though … the starches in the pasta help make the sauce. What about stirring in some cooked spaghetti squash at the end? I’ve mixed spaghetti squash with pasta and it can be pretty tasty! When adding coconut cream, are you talking about the canned coconut milk? Or like a heavy whipping coconut cream? I’m really sensitive to dairy and would love to mke tbis for thanksgiving! Thank you! Wowww!! This was so good! Way better than I was expecting, and very easy to make. When I make it again, I’ll use more nutmeg and less red pepper. But this was really really good. Ok so i’m gonna guess you turn the heat down once it boils…. The directions don’t state that. After the 9 mins, the noodles turned mushy. Nope, you keep it boiling the entire time. It might be your particular brand of pasta; if you try it again, perhaps try cooking for a little less time and see if that helps.